Quick --- can anyone name a Gloria Jean film they’ve seen other than Never Give A Sucker An Even Break? 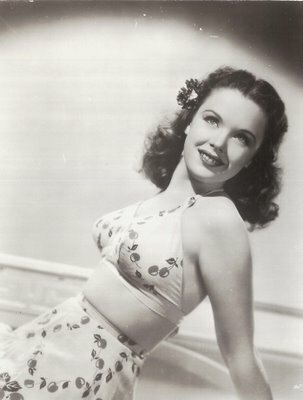 For that matter, how many people have even heard of Gloria Jean outside a select, aging group of hardened buffs? Notice I said "buffs", a term I’ve always hated, but those who call themselves "historians" have never bothered much with the Gloria Jeans of the business, and that’s too bad, because the Gloria Jeans are what the business has always been about. They’re the unsung reliables. The ones people liked to see and paid to see. Gloria’s misfortune lay in the fact that her movies reflected popular fads of the day --- jitterbug, high school (before it became a Blackboard Jungle), summer camp --- so many artifacts of popular culture that seem very remote now. Gloria didn’t get into any big pictures, other than the one with Fields, and what’s worse, most of her stuff was done for Universal, so it’s presently locked away in storage same as for the last forty years. 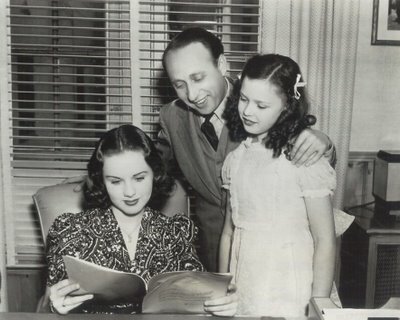 Scott and Jan MacGillivray are historians --- yes, historians --- who decided to write a book --- no, the book --- on Gloria Jean, and it’s one of the best up-and-down the stardom ladder sagas I’ve ever read. Finally, someone takes an actress who’s been ignored too long and tells her story with insight and affection. Gloria participated through the whole thing. She’s eighty this year and lays it on the line about her star years and the ones that followed. 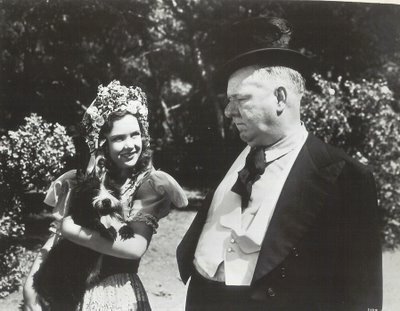 For a while during the late thirties/early forties, it looked as though she’d be the next Deanna Durbin. Ten years later, she couldn’t get one-time show-biz pals to return her calls. Once the brightest light among Universal's musical teens, she wound up a receptionist for a laboratory that sold hair products. If you go to e-bay right now, you’ll find her auctions for stills and autographs. Gloria and her sister manage the sales. The MacGillivrays set up a website for Gloria as well. You can go THERE and e-mail her. Go HERE and you can get the book. I’d strongly recommend both. Deanna Durbin couldn’t have been happy to see thirteen year old Gloria Jean coming through the Universal gates in 1939 to star in an "A" musical designed very much along Durbin formula lines, with Deanna’s own ace producer, Joe Pasternak, at the helm. The Under-Pup was indeed what the title suggested, a diminutive soprano nipping at Durbin’s heels, and a ready substitute should Deanna become recalcitrant. The older actress doesn’t seem altogether into the spirit of this otherwise happy celebration of Gloria’s contract signing. In fact, Deanna reminds me a little of Daffy that time his master brought the duckling home and decided it "could have the old duck’s room." There was little cause for worry, however, because Gloria was reassigned to the B unit soon enough, where teenage musicals were turned out like so many link sausages. Co-stars included the likes of Donald O’ Connor, Mel Torme, and Peggy Ryan. There were also players I couldn’t pick in a line-up, even though they were recognized in their day --- Ray Malone? Betty McCabe? Never heard of ‘em till I read this book, but they sang and danced right alongside Gloria. Universal "B" headliners also included Susanna (Phantom Of The Opera) Foster and Ann (Mildred Pierce) Blyth. Reading about these little musicals makes me want to see them --- but how? Maybe there’s occasional bootlegs on e-bay, but otherwise these things are nowhere. As far as I know, the last time anybody had any access to them was maybe the seventies, and I suspect they were largely off television even then. It’s frustrating when whole blocks of interesting movies simply disappear, but that seems to have been what happened here. I doubt if anyone at Universal today has ever heard of them, so you can imagine the chances of a DVD release. Much as I enjoyed reading the MacGillivray’s account of Gloria Jean’s early days at Universal, it’s those post-war struggle years that put the big transfix on me. I’ve always been a sucker for lowdown show biz at its cruelest stories, and this book has some doozies. Those Hollywood predators Gloria warded off during the fifties are like a tag-team of Stephen Boyd in The Oscar and George Peppard in The Carpetbaggers. No wonder she finally got out! Fans of Jerry Lewis will find the star living down to his reputation in Gloria’s riveting story of how he screwed her over on a hoped-for comeback in 1961’s The Ladies Man. 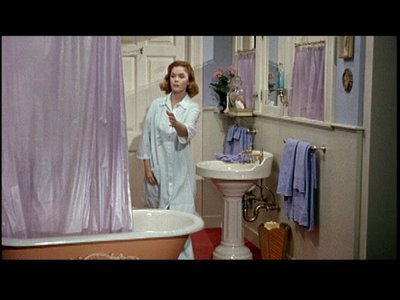 The authors even put the finished movie under a microscope and revealed the scenes wherein Gloria is fleetingly visible --- that's Gloria walking toward a bathtub here in a blink and you’ll miss it moment from the show. Jerry had promised GJ a singing part and ended up making her a glorified extra. His (mis) treatment of Gloria and others are recounted in detail, providing one more justification for my ongoing disinterest in ever meeting the guy (would have been great shaking hands with Dean, though!). The sickly sweet smell of institutionalized Hollywood corruption is revealed in Gloria’s account of the four thousand dollar application fee that was paid for her star on the Walk Of Fame (it was a gift from co-workers upon her retirement from the lab), which was then deep-sixed and the money kept. Remember that the next time you tread those fabled boulevards. It was probably her strong family relationships that assured happy endings for Gloria. Throughout the book, she comes across as very sensible and grounded, something we seldom get here at the Glamour Starter, where desperation, despair, and old-age isolation often as not make up the third act for personalities featured. Nice to have one where it doesn’t. Certainly she's the first we’ve profiled that you can e-mail today and likely receive a personal reply. 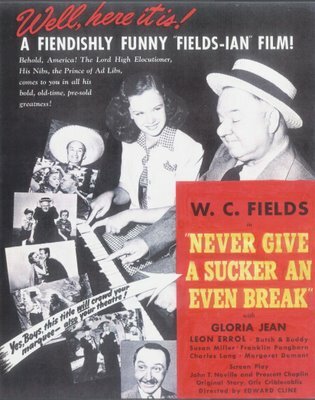 Bill Fields was a benign presence on the set of Never Give A Sucker An Even Break, according to Gloria. The MacGillivrays give us the best and most detailed account of its filming that we could hope for, and the insights into Fields, both personally and professionally, are outstanding. This trade ad illustrates how Gloria was getting a studio boost almost the equal of Bill’s --- fact is he wanted to work with her again, characterizing GJ as the daughter he’d never had. Must have been lonely at times for The Great Man. This tea party is one hosted by GJ’s idol, Basil Rathbone (that’s cool, Gloria --- he’s mine too!). They’re on the set of The Black Cat (wish they’d invited Bela). 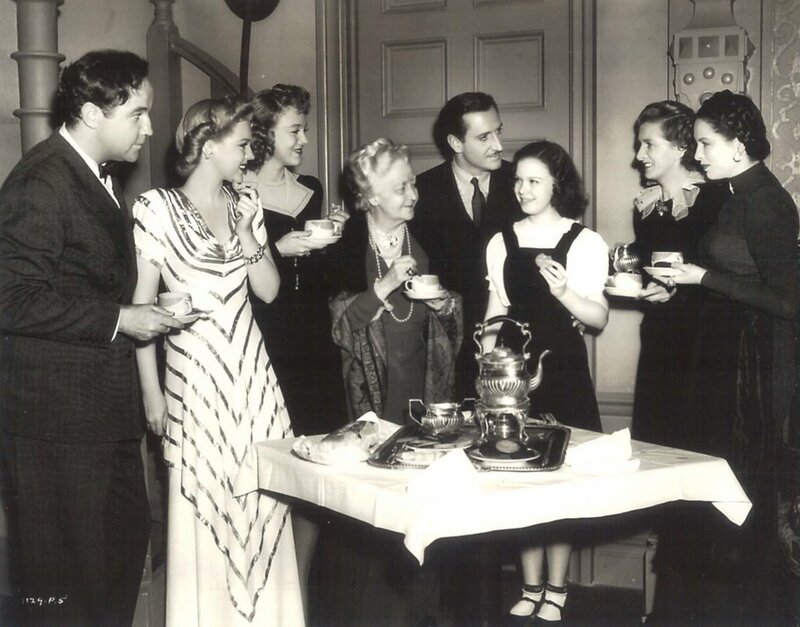 Do you suppose that’s really tea in Brod Crawford’s cup? Probably so --- he doesn’t look too enthusiastic about it. The swimsuit poses began in earnest when Gloria turned eighteen in 1944. They never pushed the cheesecake stuff too hard at Universal, but here’s evidence they certainly could have. Hey, I’d take Gloria over a lot of what did get pasted on barrack walls during that war. 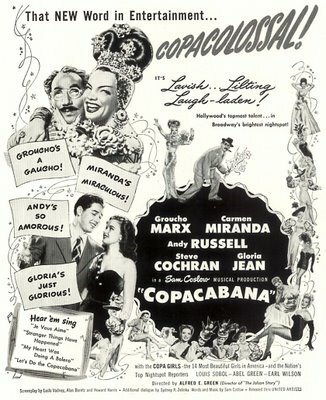 She also had nice things to say about Groucho Marx, her Copacabana co-star (ad shown here). The MacGillivray book has a raft of stills from Gloria Jean’s personal collection, including a lot of really obscure appearances that were totally unknown until research for the book revealed their existence. Actually, I believe the little girl's line to her new duckling, spoken as she's taking it up to her room, is "You can sleep where my OLD duck used to sleep!" The cartoon is Tashlin's NASTY QUACKS. Thanks for the spread and update on Gloria Jean! I have to admit, I do not think of Gloria Jean (nor Butch 'n' Buddy) very often. Now that I've seen a pic of her during her "cheesecake" years, though, I may never think of her the same way again. She's quite the cutie. 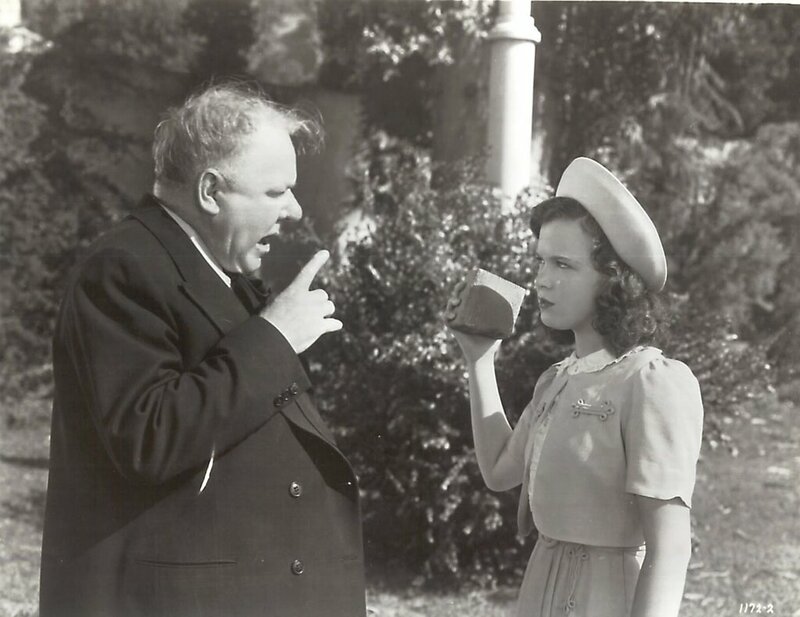 It's funny, given Fields' widely quoted disparaging remarks about Deanna Durbin (he threatened to shoot her, as I recall, and if he didn't actually say that, he could have) that he took to Miss Jean. I am wondering if maybe that was his way of sticking it to Deanna. Thank you once again for such an entertaining and informative blog. 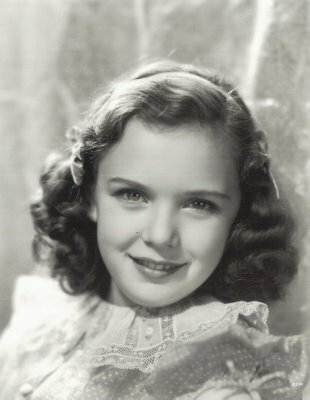 I can quite honestly say that I had never heard of Gloria Jean before, but I will certainly try to learn more about her. I have to say the Cheesecake Shot of her sitting in the chair is very sensual. I thought she had done PROMOTIONS for the Redken co.